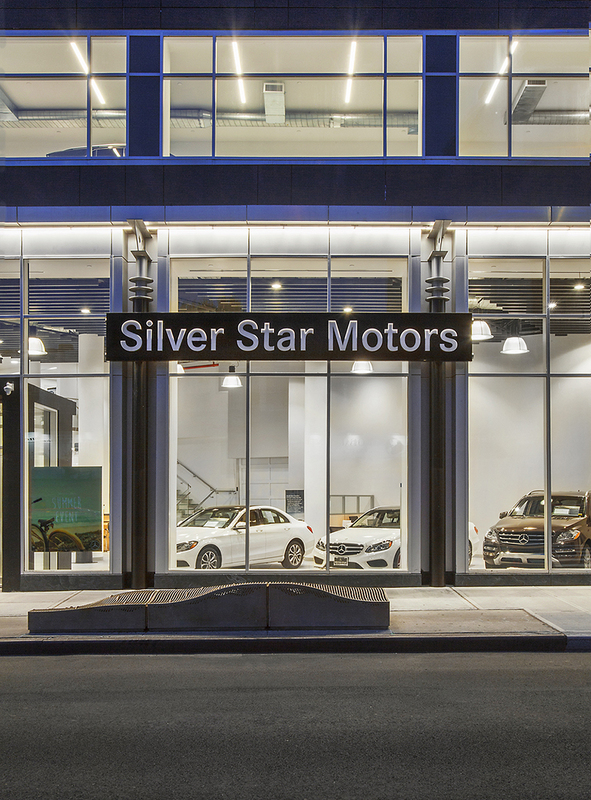 Queens, NY Silver Star Motors has opened its new pre-owned Mercedes-Benz dealership located within The Silver Star mixed-use retail/residential tower, located at 37-14 36th St. in Long Island City. Montroy DeMarco Architecture (MDALLP) served as the architect for both the mixed-use building and the new dealership. The Silver Star Motors Mercedes-Benz dealership occupies the first and second floors, and rental residential units are located on the upper floors. An affiliate of Silver Star Motors served as the developer of the new tower. The building is located next to Silver Star’s existing new car dealership. Silver Star Motors is a family-owned and operated Authorized Mercedes-Benz dealer, in operation since 1952. The company serves buyers of both new and certified pre-owned passenger Mercedes-Benz vehicles, as well as Mercedes-Benz commercial vans. Its Mercedes-Benz Certified Service Department is one of the highest rated in customer satisfaction. Silver Star Motors received the 2017 Mercedes-Benz Best of the Best Dealership Award. The Silver Star is the first new high-rise mixed-use retail/residential building in east Long Island City/Dutch Kills section, located along Northern Blvd. The lower portion of the building – from the second floor slab edge down – features a rain screen of aluminum panels. “While this finish is stipulated by Mercedes’ branding guidelines, MDALLP called for increasing the spacing between the panels to provide an extra textural element. We also specified a double-height entrance for the residential portion entry of the building, located between the dealership and the service facility entry. Overall, the façade’s design picks up on the use of the first two floors as a car dealership and the site’s heritage in luxury car sales,” said Elizabeth Zagarello, AIA, MDALLP’s project manager. The dealership windows on Northern Blvd. are 17’ high and take up the entire length of the south side of the building – approximately 110.’ It is a curtain wall system with anodized aluminum mullions – a standard Mercedes configuration. Signage is on the windows between the first-floor columns. “In keeping with the Mercedes aesthetic, decorative black columns are used on the façade. We created niches in the façade and stepped the columns out. Incorporating these decorative columns into the building required both design creativity and experience in navigating complex New York City zoning regulations. 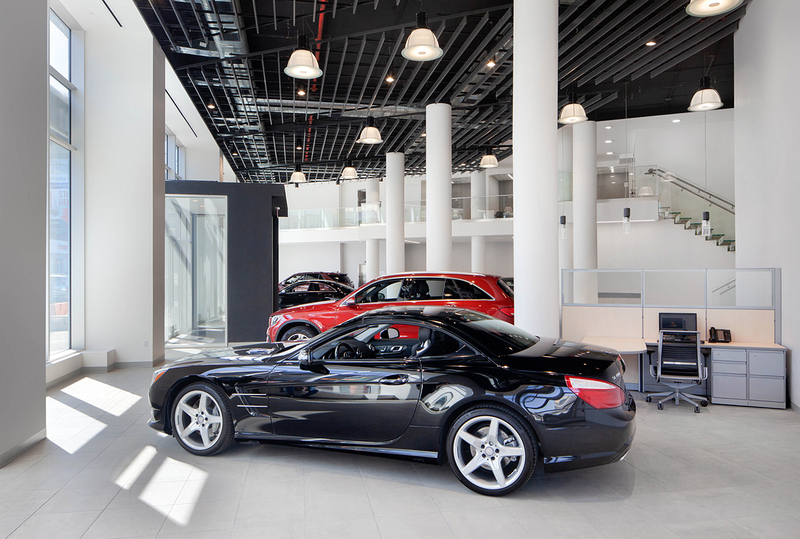 Mercedes-Benz’s guidelines specify that columns needed to be set out, away from the building. However, the City’s zoning laws and lot-line regulations prohibited this. We came up with the solution to set back the columns into the façade and create niches around them to satisfy the dealership design guidelines in a manner that complied with building regulations,” said Zagarello. On the first floor, the flooring is gray porcelain tile that can withstand car traffic. The ceilings are 20’ high and are of flat-plate concrete. To satisfy Mercedes’ “industrial look” standard and reduce ambient noise in the expansive space, MDALLP used a suspended acoustical baffle system that mimics the look of structural beams. Ductwork is exposed half-round oval, and only partially hidden by baffles. Columns of smoothed concrete are exposed. The first floor houses the showroom, a coffee station, desks for sales associates, and – behind a vertical lift garage door – an internal vehicle service and parking area. An architectural stair with glass treads leads to the mezzanine-level executive offices and conference room. The mezzanine features balcony-type walkway that overlooks the sales floor. The second floor is a parking area for employees and additional car storage space for the showroom. A car ramp connects the floors. The architects chose linear lights set perpendicular to the Northern Boulevard façade to highlight cars parked against the window of the sales floor. Both floors are well-lit. The lights in the dealership had to be between 70 and 90 foot-candles, while installed at the 20-foot height on the first floor and mezzanine, and nine-foot height on the second floor. The design team selected high-bay LED pendant fixtures that fit in the industrial style of the space and the Mercedes standards, but still have the required power and color spectrum to properly serve the retail purpose of the facility. In addition to architect and designer MDALLP, the project team included general contractor 1 Oak Contracting, interior designer for the residential section Fogarty Finger Architecture, service center design consultant Dealer Solutions and Design, structural engineer Gilsanz Murray Steficek, the mechanical/electrical/plumbing (MEP) engineer Lilker Engineering, geotechnical and S.O.E. engineer and environmental consultant GZA GeoEnvironmental, civil engineer DeRosier Engineering, audiovisual/IT/security consultant Sage Security. MNS Real Estate is serving as a leasing broker and marketing agent for the residential section of the property. The initial concept for the site’s development simply was to build a new pre-owned showroom for Silver Star Motors and expand the company’s existing pre-owned sales parking. Silver Star is a Mercedes-Benz dealership that has been selling new and pre-owned luxury automobiles to customers since 1972. During preliminary discussions about the design for an expanded dealership with Silver Star’s principal Michael Cohen, MDALLP’s DeMarco recommended performing a residential test fit based on the property’s zoning. “Based on our experience in optimizing buildings’ size and revenue, while working within the complex New York City zoning regulations, we thought it best to maximize value for the owner and perform a test fit that would provide the highest return on investment. Our analysis showed that 85 apartments could be developed on the site within the local zoning guidelines. The owner/developer decided to go forward with the residential component, in addition to the originally planned pre-owned dealership section,” said DeMarco. The units comprise 30 studios, 27 one-bedroom units, 28 two-bedroom units, and two three-bedroom units. The building caters to the needs of young professionals, especially those working in the technology sector, both in Manhattan and Long Island City. The property offers extensive tenant amenities, great views, and a very convenient and brief commute to Manhattan. The building’s structural system is flat-plate concrete, or concrete floors with rebar. The cellar level houses residential parking spaces, residential storage, and utility systems. The client wanted an industrial loft-like feeling to the outside of the building. 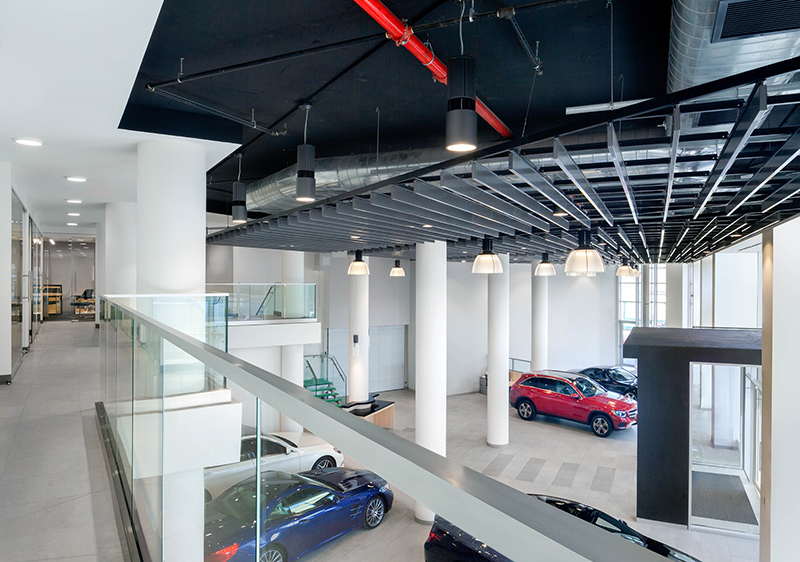 However, because of the need for large open spaces in the dealership on the lower floors, columns were not spaced regularly throughout the building, making it difficult to create large loft windows and spaces. MDALLP solved this challenge by designing a façade in a manner that maximizes the alignment and size of the windows. The building’s exterior also features large horizontal, textured concrete prefabricated panels installed as a rain screen system. The panels are made from high-performance concrete in a grey gray finish that resembles stone. On the residential floors, windows feature black anodized aluminum frames and traditional PTAC A/C units under the windows. Many of the apartments include private terraces that are as large as the apartments themselves. The street-facing wall on the Northern Boulevard side features large dormers, which in accordance with the building code allow for additional height of this section of the building. MADGI took advantage of the dormer allowance to enlarge the footprint of the residential section of the building and maximize the design efficiency as well as to enlarge the floor height. A strongly defined dormer accentuates the sharp corner of the structure, creates a visual anchor for the building, and adds a visual levity to the architectural design.